Roasted asparagus pesto, pickled red onion, & goat cheese. Pairs with Star, N.C.
Medium-bodied red with notes of plum compote, blackberry, clove and pepper. Petit Manseng & Steel and Stone from North Carolina's leading wine producer. Honey Basil, Raspberry Mint, or Ginger Beer.12oz bottle. Tropical fruit notes packed with fresh gooseberry and lime flavours. From Huia Vineyards. Not too oaky, not too fruity- a balance of tropical fruit, cream and vanilla. Medium-bodied and well-balanced with flavors of boysenberries, vanilla and smoky notes. Draft cider from Denver's Stem Ciders. 16oz. A limited release from Cedar Grove's Botanist & Barrel! Bottle, 375ml. Welcome to the Scythe & Sparrow, Fullsteam’s tavern-focused membership club. 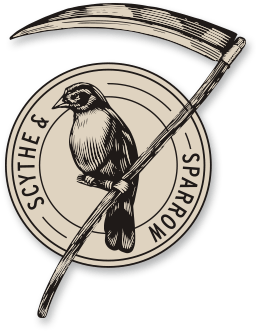 Scythe & Sparrow members enjoy a 20-ounce pour for the cost of a sixteen-ounce pint, a 20% discount on beer-to-go and merchandise, first dibs on seasonal bottle releases, and members-only shenanigans. The cost for a twelve-month membership is $59 and $99 for couples. Membership is valid for a year from your registration date.